Our standard cooled slits consist of two slit blades that move together in opposite directions to vary the aperture. The slits are stepper motor driven and fitted with limit switches and datum switches. Encoders can be fitted as an option for continuous position feedback. Slit blades are made from tungsten or tungsten carbide and are chamfered to a knife edge. 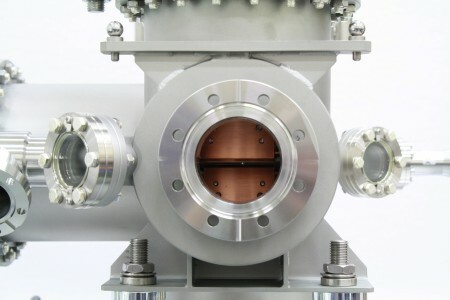 The slit mechanisms are mounted on a flange with the slit blades precisely aligned to the face of the flange and tested for parallelism and precision of motion.